You must have have heard about a new device creating 3-d solid objects using digital technology. This devices is called 3-d printers and can “print” in plastic,metal, nylon, and over a hundred other materials. It can be used for making nonsensical little models like the over-printed Yoda, yet it can also print manufacturing prototypes, end user products, quasi-legal guns, aircraft engine parts and even human organs using a person’s own cells. 3-D printing or additive manufacturing is a process of making three dimensional solid objects from a digital file. The creation of a 3D printed object is achieved using additive processes. In an additive process an object is created by laying down successive layers of material until the entire object is created. Each of these layers can be seen as a thinly sliced horizontal cross-section of the eventual object. To prepare the digital file created in a 3D modeling program for printing, the software slices the final model into hundreds or thousands of horizontal layers. When this prepared file is uploaded in the 3-D printer, the printer creates the object layer by layer. 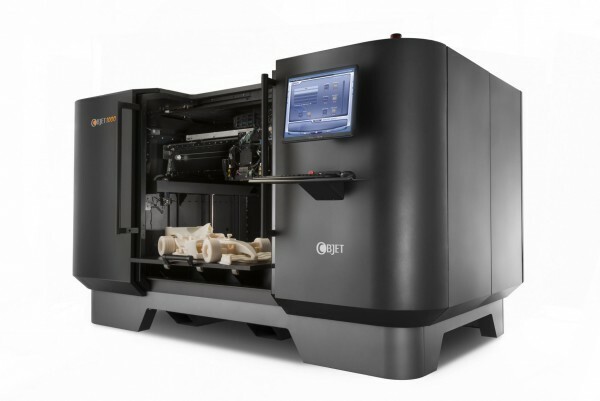 The 3-D printer reads every slice (or 2D image) and proceeds to create the object blending each layer together with no sign of the layering visible, resulting in one three dimensional object. Not all 3-D printer use the same technology to realize their objects. There are several ways to do it and all those available as of 2012 were additive, differing mainly in the way layers are build to create the final object. Some methods use melting or softening material to produce the layers. Selective laser sintering (SLS) and fused deposition modeling (FDM) are the most common technologies using this way of printing. Another method of printing is to lay liquid materials that are cured with different technologies. The most common technology using this method is called stereolithography (SLA). This technology uses a high power laser to fuse small particles of plastic, metal, ceramic or glass powders into a mass that has the desired three dimensional shape. The laser selectively fuses the powdered material by scanning the cross-sections (or layers) generated by the 3D modeling program on the surface of a powder bed. After each cross-section is scanned, the powder bed is lowered by one layer thickness. Then a new layer of material is applied on top and the process is repeated until the object is completed. 1980s, under sponsorship of DARPA. The FDM technology works using a plastic filament or metal wire which is unwound from a coil and supplies material to an extrusion nozzle which can turn the flow on and off. The nozzle is heated to melt the material and can be moved in both horizontal and vertical directions by a numerically controlled mechanism, directly controlled by a computer-aided manufacturing (CAM) software package. The object is produced by extruding melted material to form layers as the material hardens immediately after extrusion from the nozzle. FDM was invented by Scott Crump in the late 80’s. After patenting this technology he started the company Stratasys in 1988. The software that comes with this technology automatically generates support structures if required. The machine dispenses two materials, one for the model and one form a disposable support structure. So far we’ve only talked about commercial 3-D printer. There is a whole other world of 3-D printers: personal and DIY hobbyist models. And they are getting cheap, with prices typically in the range of $300 – $2,000. The RepRap open source project really ignited this hobbyist market in the same way the Apple I microcomputer ignited the hobbyist desktop computer market in the late 1970s. For about a thousand dollars, people have been able to buy the RepRap kit and put together their own personal 3-D printer, complete with any customizations they were capable of making. And what’s more, these printers print most of the parts for more printers. RepRap is short for replicating rapid prototyper, so complete self-replication, including electronic circuit boards, is the goal. The interest in RepRap spawned scores of other low-cost 3-D printer, both DIY and fully-assembled, and as the prices keep coming down, it puts 3-D printer into more and more and more hands. If you don’t have your very own 3-D printer, not to worry, there are 3-D printing service bureaus like Shapeways and Ponoko that can very inexpensively print and deliver an object from a digital file that you simply upload to their user-friendly website. It’s almost as easy as ordering a custom t-shirt from Cafepress or Zazzle.